Using the Orff-Schulwerk approach, this book presents an overview of how to teach the elements of music -- rhythm, melody, timbre, and movement. 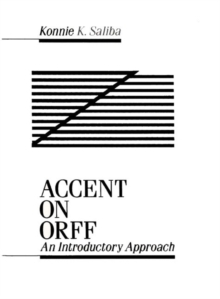 This book explores features unique to the Orff-Schulwerk approach -- pitched and nonpitched percussion instruments, ostinato, bordun, improvisation, and elemental musical forms. Presenting all material in a lesson-plan format, this volume provides varied ways to approach movement -- games, structured movement, and creative movement. Elementary school music teachers.